Neyland Community School is one of four schools in the county to receive a Partnership Working Award from the Family Information Service (FIS). To win the award the school had to satisfy a number of criteria including promoting the FIS through presentations and meetings. 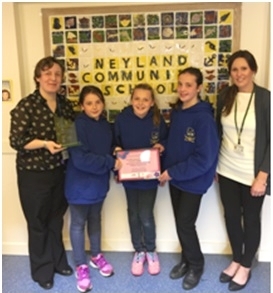 Neyland School’s family liaison officer, TJ Stables (left) is pictured with pupils Megan Lewis, Anais Phillips and Sara Llewellyn with family information officer, Laura Richards. This entry was posted in Community news on May 19, 2016 by admin.